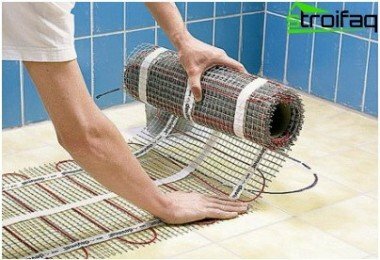 Universal health formula that headshould be kept in the cold, and legs - in the warmth, and is known to all, in practice, easily performed in areas with environmentally friendly water heating floor, the main working elements are pipes for floor heating. The concept of the space heating process is to create a space between the base floor and topcoat pipe network through which coolant is circulated. In most cases, the coolant is heated to the optimum temperature of the water, but can be used ethylene glycol, or antifreeze solution. 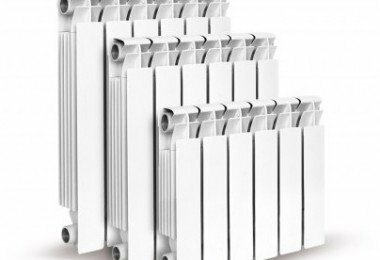 water underfloor heating system uniformlyIt distributes the heat in the room and has advantages over other methods of heating, with proper selection of tubes and calculating the inherent components of the heating system. 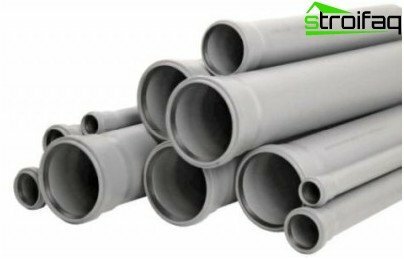 Polypropylene pipes for floor heating lessothers are used in underfloor hot water heating arrangement, despite the most reasonable prices. Their main drawback - too large bending radius equal to 8 diameters. 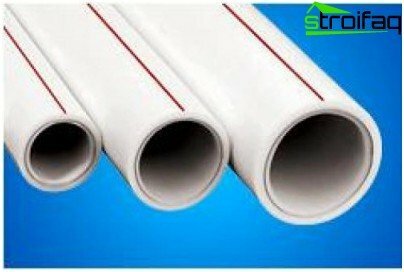 For example, the corresponding figure of polyethylene pipes - 5 diameters. 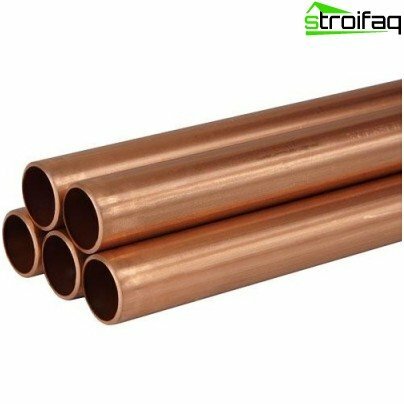 This means that when 16 mm diameterPPR pipes can be laid only with a minimum distance of 128 mm, which is not always sufficient to provide thermal design power of the heating system. 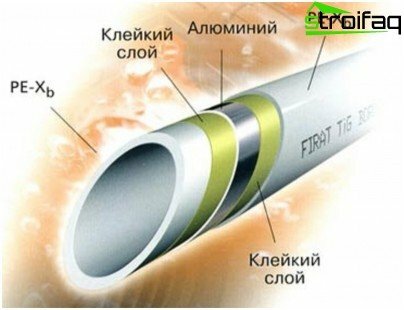 Also reduces the popularity of polypropylene pipes limit their installation temperature, which should not be below + 15 ° C, ie the installation of this type of pipes in the extreme climatic conditions that differ most Russian regions, is not recommended. the likelihood of anti-diffusion layer damage during installation and pouring concrete screeds. inclination to the hall in case of exceeding the permissible bending radius. Copper pipe for underfloor heating - perfectan option that meets all the conditions of resettlement and underfloor heating provides the highest level of reliability and quality. 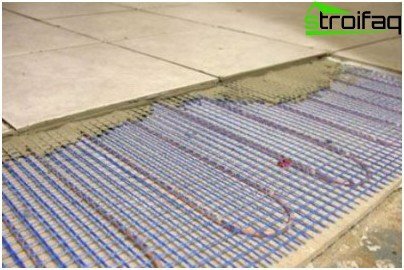 There is only one drawback, which prevents the widespread use of copper pipes in floor heating systems - their high cost. 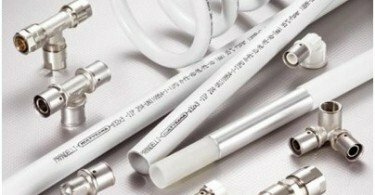 Korma manufacturing material the right choicepipes for floor heating should consider the coolant pressure in the riser central heating or hot water supply and the area of ​​heated space. Depending on these variables selected optimum pipe diameter: underfloor hot water heating using pipes with a diameter of 16, 20 or 25 mm. Installing structure underfloor pipe smaller than desired diameter often leads to disruption of circulating water therein. The water pressure in the riser can be measured independently, connecting the hydraulic pressure gauge, or to learn the technical department dispensation. Next the value of which determines the calculation ofpipes for floor heating - its length. 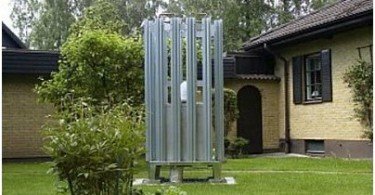 Getting to the calculations, it should be noted that the laying of pipe systems start from the walls with windows to hot coolant heats the first cooler air, and then only uniformly distributed throughout the system. In places the room where you plan to install the built-in furniture or other bulky pipes are usually not paved. To obtain more accurate results, tothis stage it is advisable to also determine which way will be laying the pipes in the floor. 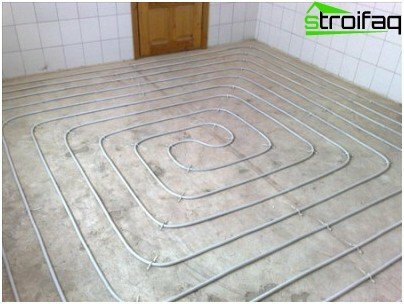 Today, the most popular two circuits of water underfloor heating: snake (or zebra) and shell (snail, helix). Contour "snake" is widely used in the WestEurope attracts the simplicity of calculations and installation. But this circuit does not provide uniform heat distribution and the effect of "zebra" is manifested in significant temperature differences separate floor sections that correspond to the input and output circuits. If the maximum system operating modes are often on separate sites of the floor temperature may exceed the permissible value. 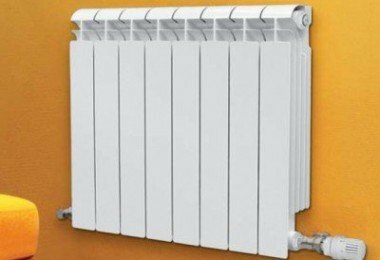 The level of comfort of the heating system is reduced, heat loss increases. Laying pipe "snake" is justified in areas with little heat loss and the amplitude of fluctuations in water temperature at the inlet and outlet of about 5 ° C.
Contour "snail" is widespread in the vastCIS, in spite of the more complex as compared to the "snake" design features and installation. The popularity of this method of laying pipes due to the uniform distribution of heat across the heated surface of the floor, thanks to the alternation of hot laid parallel to the supply and return pipes of cooled slightly. 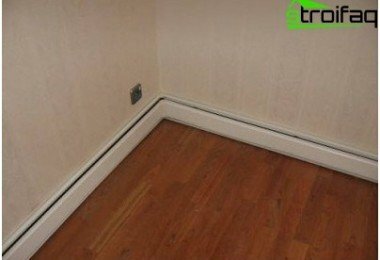 In this construction, floor heating the coolant return point is exactly in the middle of the pipe length, and the average temperature is unchanged in any part of the floor. Finally, you can start the calculations. On a sheet of graph paper, or any other cell in the need to draw a floor plan based on the input group and windows in a scale of 1:50, and portray on it a scale outline of the future floor heating, from the closest to the riser wall with windows. In accordance with current building regulations underfloor heating pipe must be laid at a distance of 20-25 cm from the walls and pipes step depends on their diameter and is usually 35-50 cm. In the finished drawing is easy to measure the total length of the circuit scale. Multiplying that number by the scale factor of 50, we get the real pipe length in meters, not forgetting to add a further 2 meters to connect to the riser loop. Installation of water underfloor heating begins withaligning basis by using a special cement-based solution. On the frozen surface of the layer stack of the polymer foil vapor barrier and insulation for heat shield effect, glued it on tape the joints of aluminum, and the excess is cut so that the edges of the walls went 3-4 cm. Then, the laying of floor heating pipes in the drawing . Bending pipes recommended by a specialmounting spring corresponding diameter: it is put on the tube and does not allow it to lean. Pipe bend hands, it is difficult accurately to withstand bending radius and avoid fractures. Ready loop fix specialplastic fasteners under the tie and connected to the riser. On the input and output circuit pipe fittings installed by treating the compound heat-resistant sealant, and then reconnect them to the exit and entry of the riser, respectively. After completing work on the assembly and fastening underfloor heating circuit, fill the tube with water and check the system for leaks, and then perform a coupler mounted and surface finish. Underfloor heating water is combined withfloor tiles, linoleum and parquet. 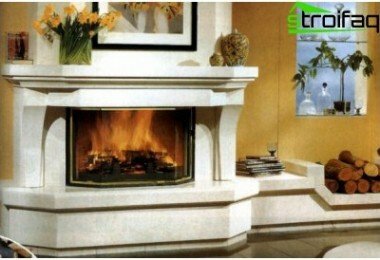 It is environmentally friendly and economical, and the efficiency and durability of the floor heating depends to a large degree by the cost of material and pipe, and on the correct design and careful implementation.